Spiritual path is, should be, a process of pulling the rug out of your feet. That’s how it should be. Just as you are feeling comfortable on one rug, pull that rug out and you collapse. The bodhisattva who wishes to follow this path must invest time and energy to understand law and rule of, or the truth of depending arising. The dependent. Nothing is independent. That everything is dependently arising. A bodhisattva must pay attention, invest time and energy to understand that. And by the way this is the quintessential Mahayana path, aim of the Mahayana path, to understand the dependent arising. Wishing, longing, aspiring, working hard to understand the dependent arising is offering to the Buddha, it is the meditation, it is the generosity, it is the discipline, it is so called meditation, it is basically Mahayana path. Trying to understand dependent arising. For Buddhist, and specially Mahayana Buddhism, pain, release from the pain, path, all these exist within the realm of relative truth. Nothing else. If you are having a nightmare while sleeping on a nice bed, this is what Buddhist would say: Before you even slept, the nightmare did not exist. Of course not. That’s nothing unusual. But what the Buddhist are saying is: even as you are having the nightmare, while you are having the nightmare, actually it’s not happening. That’s a difficult to chew, this one. Because you will always: But I am being, you know, there is an earthquake, there is a monster about to eat me, all of that. But now there is another one that is even more difficult. Which is: after waking up from the nightmare to understand that the nightmare never existed, that’s even more difficult. Because that sense of relief from waking up from a nightmare is just so good. So how can you say that there was nothing. But anyway if you are to study and follow the Mahayana path, this is the view that you have to be brave enough to accept. This is kind of ironic. Dharma, not as the truth but as the path, the teaching. Do you know the path exists because there is a dualism? Because there is a confusion. Therefore there is a path. Once the dualism or the confusion is finished, path is also finished. Not only it is not necessary, it is also gone, simultaneously. Meanwhile, wish to achieve that, wish to attain that enlightenment is necessary. I think first of all devotion is an ignorance. This we must know. Because it is a path. It has to be part of that corrosive path. Right. It is not something that we keep as a souvenir in the future once we get it, once we get what we want. Okay. Therefore, like many things, devotion has a blind element. Like I think word believe is quite good to describe, this element of so called believe. Shakyamuni Buddha in the Sutra, his teaching on emptiness is just amazingly logical I would say. So much argument, so much analysis and all of that. But at the end he told Ananda, ?? ?, this is if you want to sort of intellectually understand, this is how it goes okay in emptiness. But if you really want to realize it the only way to realize is through the devotion. And this makes a big sense because actually it doesn’t matter who you are, you could be this sycophant, devotional superstitious backward primitive gullible. Or you could be critical, scientific, objective, rational, whatever you want to call it. We all human beings, all sentient beings, not only human beings, there is only one thing we can do at the end of the day. And it is called believe. Nothing else. Even so you are not believing, even you pride yourself so being critical to this this this you are believing so blindly to this reason why you are not believing in this and that. It always goes down to, boils down to so called believe. And remember I was telling earlier, freedom from known. When you are totally free from a known, or reference, then that is quite a high level, really high level of devotion. Because, you know the trusting and not trusting has a very very, the difference between trust and non trusting is so thin line. When you do not trust something, then you are blindly believing in reason for not trusting something. You are being nihilist basically. So when both, when you shrug off both your hang up of trusting and not trusting, when you are no more trapped by a known, then you have a devotion. This is, then you have nothing to lose. In order to, it is very funny isn’t it, in order for us to liberate from a system we need a system. That is the only way. No other ways. But there are certain system that are designed to cancel itself. That’s why taking refuge to the Buddhadharma is non deceiving. There are certain path that is designed to not to cancel itself actually, to really remain yourself as it is, I mean whatever the system. That is dictatorial actually. That is very tyrannical path actually. Very dangerous , extreme view. All sorts of fanaticism will emerge from this kind of path. System I have to repeat this again is unfortunately a necessary tool to break all the system. 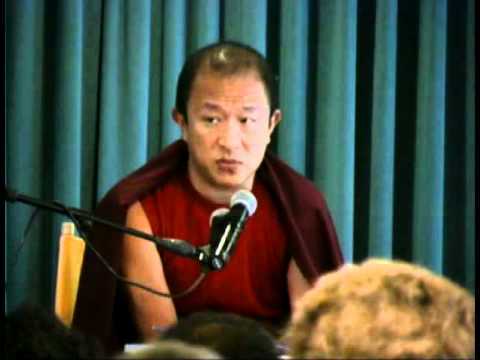 And Jamyang Khyentse Choekyi Lodro said: If you want to see the buddha nature, the closest, the closest reflection of this buddha nature is this physical human guru. Other than that, there are many distant reflection like the Shakyamuni, you know Avalokiteshvara. Those are distant though. Those are distant. And this is a big point. See this is also why the guru path makes the path short. Because you know, with Shakyamuni Buddha and all of this, they will never come and correct you, you understand. You can do anything. You can basically interpret your path. This is the problem with the guruless path. Now then the next question is how much time do we have? Do you want to do it quick? Yes then, you know, the guru comes in here. And the guru, yes guru is difficult, really difficult. This guru business is really difficult. Situation like this happens. And needs a really strong devotion towards the path in order to apply the guru path as path. Maitreya said: “A path has to be abandoned.” Path is like a boat, you go to the other shore, use the boat, you reach the other shore. What do you do? You abandon the boat. You don’t stand on the boat because boat looks beautiful. Because otherwise you are not on the other shore. Yes the boat looks beautiful, boat is so smooth, boat is so, and you had the best time with this boat. But your aim is to reach the other shore. Likewise, when you reach the Buddhahood, not only the Vajrayana, all the other yanas are gone. Has to be.